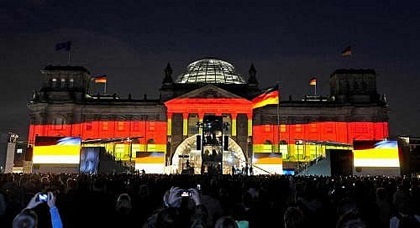 At the end of World War II, Germany was a defeated nation occupied by foreign powers. It had lost its national sovereignty, and the world saw it as a pariah, guilty of crimes without parallel in history. In addition to rebuilding their shattered country in a physical sense, most leading German politicians saw their main goals in the coming decades as restoring their country’s reputation, regaining its sovereignty, and becoming once again a member in good standing in the community of nations. 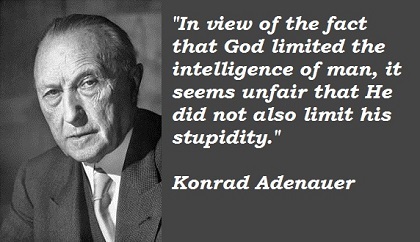 The figure who dominated West Germany’s politics in its first two decades was Konrad Adenauer, a politician totally committed to restoring his country to an honored place among nations. He saw little likelihood that the Soviet occupation of East Germany would soon end; hence, he sought to build a strong West Germany firmly attached to the Western community of parliamentary democracies. As president of the Parliamentary Council, Adenauer had played a leading role in the process of finalizing and passing the Basic Law in 1949. Even before he participated in fashioning the country’s constitution, Adenauer had had a long and eventful political career. Born in 1876 in Cologne, he studied law and economics and became active in local politics. As a member of the Catholic-based Center Party, he became the mayor of his home town in 1917. The National Socialists deposed him in 1933, and, after the attempt on Hitler’s life on July 20, 1944, he was arrested and imprisoned for four months. After the war, the United States reinstalled him as mayor of Cologne. The British military authorities, however, fired him from this position because of alleged incompetence. In March 1946, Adenauer became chairman of the CDU in the British occupation zone and, after having shown extraordinary leadership in the deliberations on the Basic Law, became the first chancellor of the newly formed state. One of Adenauer’s main goals was regaining his country’s sovereignty. Although the Basic Law gave full legislative, executive, and judicial powers to the new FRG and its Länder, certain powers were reserved for the occupying authorities. The Occupation Statute, drawn up in April 1949 by the foreign ministers of the Four Powers, gave the occupation authorities the right to supervise the new state’s foreign policy, trade, and civil aviation, as well as the right, under special circumstances, to assume complete control over their own occupation zones. By means of another statute, the Ruhr Statute, likewise concluded in April 1949, the administration of the resources and industrial potential of the Ruhr area was also kept under foreign control. In the past, the area had been a key element in the building of Germany’s military machine. 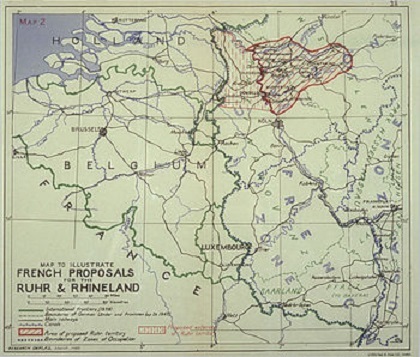 France, in particular, sought safeguards against future threats to its national security by arranging the creation of the International Authority for the Ruhr, which, under the direction of France, Belgium, the Netherlands, and Luxembourg, controlled the distribution of the area’s resources. Although the Ruhr Statute was designed to prevent Germany from ever again becoming a threat to its neighbors, it later served as the first instrument of economic cooperation for the region. In conformity with the Petersberg Agreement of November 1949 with the Western Allies, the FRG became a member of the International Authority for the Ruhr and was granted the right to establish consular relations with foreign countries. Furthermore, the dismantling of German industrial plants in the Ruhr area was largely stopped, and Germany was allowed to again build merchant ships. The winning of these important concessions was Adenauer’s first major success as chancellor. 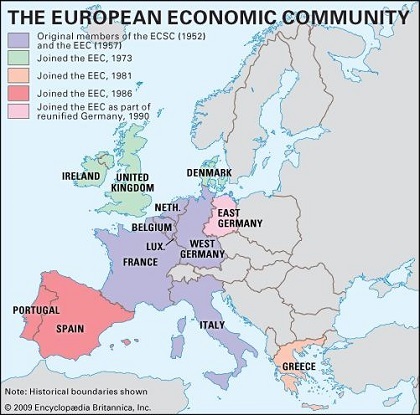 In the spring of 1950, French foreign minister Robert Schuman recommended the creation of the European Coal and Steel Community (ECSC) to revive European economic cooperation and prevent future conflict between France and Germany. According to Schuman’s plan, countries willing to place their coal and steel industries under an independent authority could join. Once again, Adenauer seized the opportunity to further integrate West Germany into Western Europe. Against the SPD’s strong opposition, the FRG entered into negotiations with France, Belgium, the Netherlands, Luxembourg, and Italy on the formation of the ECSC. Negotiations were successfully concluded in June 1952. The ECSC superseded the International Authority for the Ruhr and laid the foundations of the future European Community. Adenauer’s conciliatory but resolute foreign policy also secured the admission in 1951 of the FRG into the Council of Europe, a body established in May 1949 to promote European ideals and principles. Another important step for the FRG on its path toward reentry into the community of nations was Adenauer’s unwavering position on restitution to the victims of Nazi crimes. Of particular significance was the normalization of relations with Israel and with the Jewish people in general. Although the terrible atrocities that had occurred during the war could not be undone, material restitution could at least improve the lot of the survivors. In 1952 a reparations agreement with Israel was arranged that called for the payment of DM3 billion to the Jewish state over the next twelve years. Additional agreements with Jewish organizations provided for restitution to Jewish victims throughout the world. Through such actions, the FRG sought to meet its obligations as the legal successor to the German Reich, a position it had accepted since the FRG’s founding.